Aadhaar Card Correction / Update Form (Name, Address, Mobile Number, DOB) SSUP Self service Update Portal: Aadhaar Card is a very important document or an identity proof for every citizen of India. Many people take the presence of this Aadhar card very lightly, but there are some major advantages which are involved with an Aaadhaar card. Thus, if there are any mistakes which are there in an Aadhaar card, it is very important that one gets it rectified as soon as possible, through the provision of Aadhaar card Correction, which is a benefit provided by the government. Now, one may wonder that how one can get such corrections done through the Aadhaar card correction / update form. We will come to it, but before that, it is extremely important that you know what an Aadhaar card and self service portal is and why it is so much required. 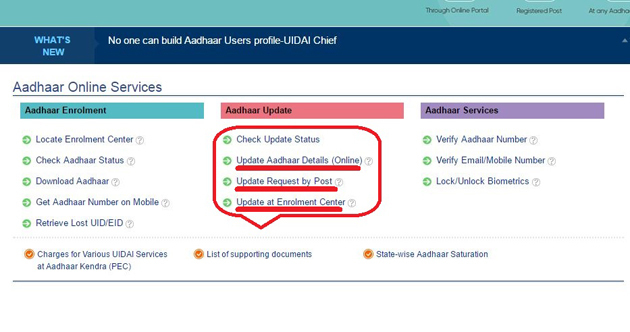 SSUP Aadhaar card Update through online mode using ssup update portal. Ideally, there is no amount of money which has been assigned as “application fee” for Aaadhaar card Update on Self service update portal. This directly means that you can do Aaadhaar card correction and get your Aadhaar card updated for free of cost or no charges. But, if you are looking forward to visiting some nearby authorized center for getting your Aaadhaar card updated, then with every visit, you have to pay an amount of Rs.25/- approximately every time. 2 How to Make Aadhar Card Correction / SSUP Update?